Almost was home, back from a client where I fixed some computer problems. Then I realized that I had left my usb memory stick in my client’s computer. Now I had a hard choice, drive back 100 km or let my client send back the usb stick with lots of information he does not need to know. Do you recognize this and do you have fine soldering skills? Then this product is something for you. 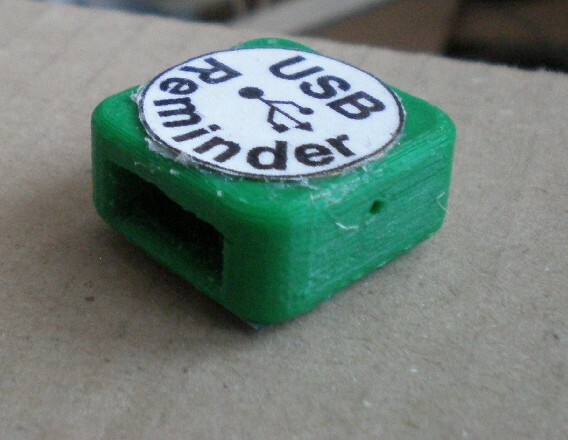 This is an usb cap that sounds an alarm when it has been empty for a longer time. The alarm is repeated every minute. When you always keep the cap with you, you will never forget an usb stick again. The default alarm time is 5 minutes. In this unit you can set the alarmtime to values between 1 minute and 2 hours.